Winner of the JPMA Parents' Pick Award this year, the new Kolcraft 1-2-3 Ready-to-Grow Activity Center will be available in the fall. 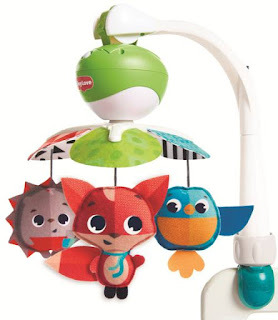 It features three different stages and grows with your child from infant to toddler: Stage 1 - Seated Entertainer; Stage 2 - Activity Table with Shape Sorter; and Stage 3 – On-the-Go Magnetic Art Easel. 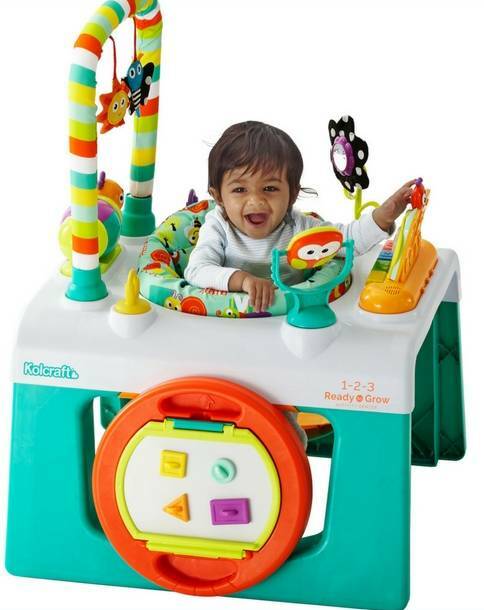 The activity center has a variety of developmental toys, including the Play & Learn Piano which provides 3 levels of developmental fun that grow in complexity for constant learning fun, and teaches in both English & Spanish. A height-adjustable seat spins 360 degrees for easy access to all toys, and the magnetic art easel can be used on-the-go with 4 colorful magnets in 4 different shapes. 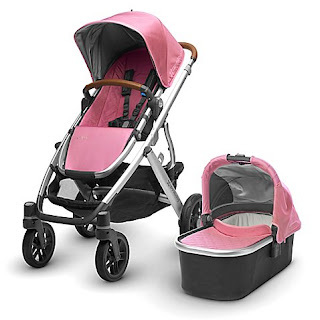 The stroller comes with the chassis, stroller seat and bassinet. 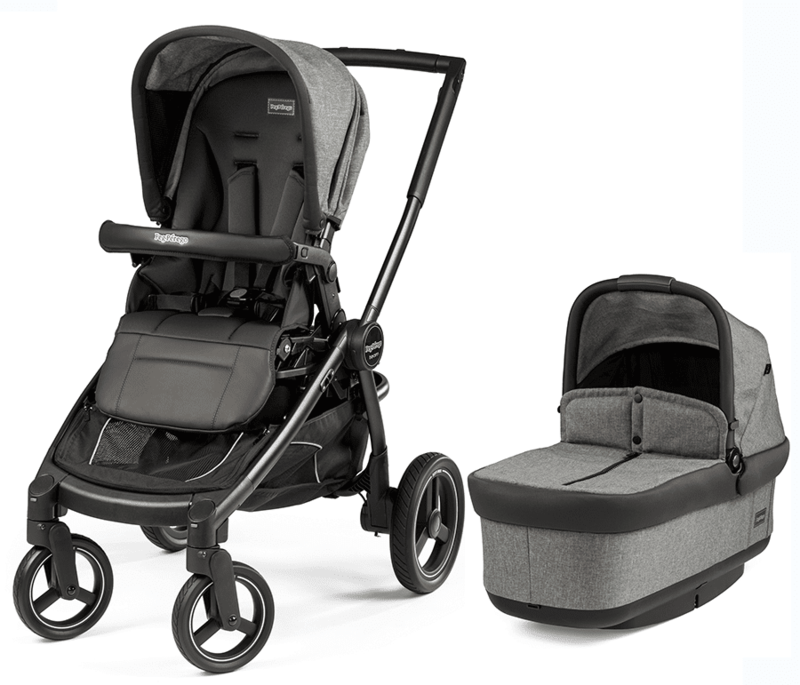 With the use of the Team Adapter (sold separately) it converts into a double stroller with a second seat of the same size. 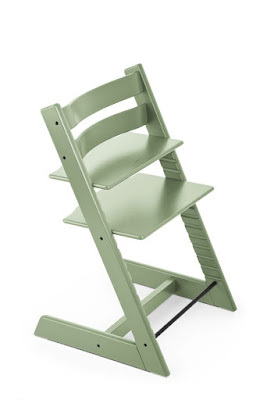 You can also use one with the other or one seat with the bassinet or car seat. Primo Viaggio infant car seats attach directly onto the chassis – without the need for adapters. 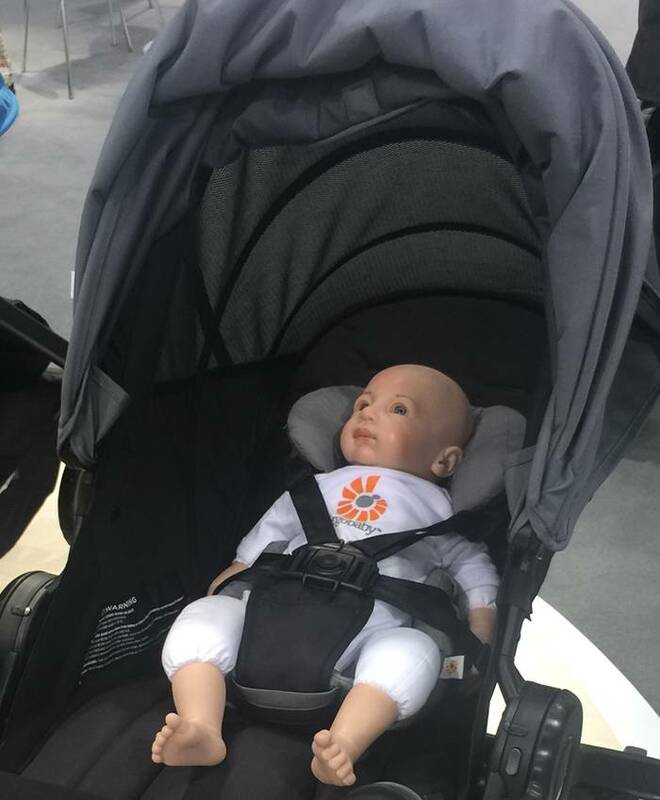 Kioma calls itself the re-imagined infant car seat. It was designed from the ground up to be the safest infant car seat in the world. And the lightest. And the strongest. And the best looking. Here is what they did. 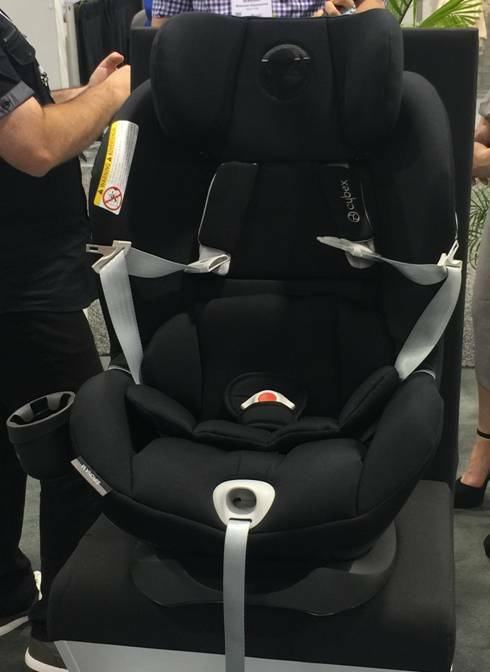 Safety - The Kioma Car Seat has achieved one of the best head injury criterions (a composite score of occupant head accelerations) the infant car seat market has ever seen. The unique handlebar acts as an anti rotation device in the event of a collision. It also helps protect your child outside of the car, from possible drops by a caregiver and it always stays in place, so injury from a moving bar never happens. 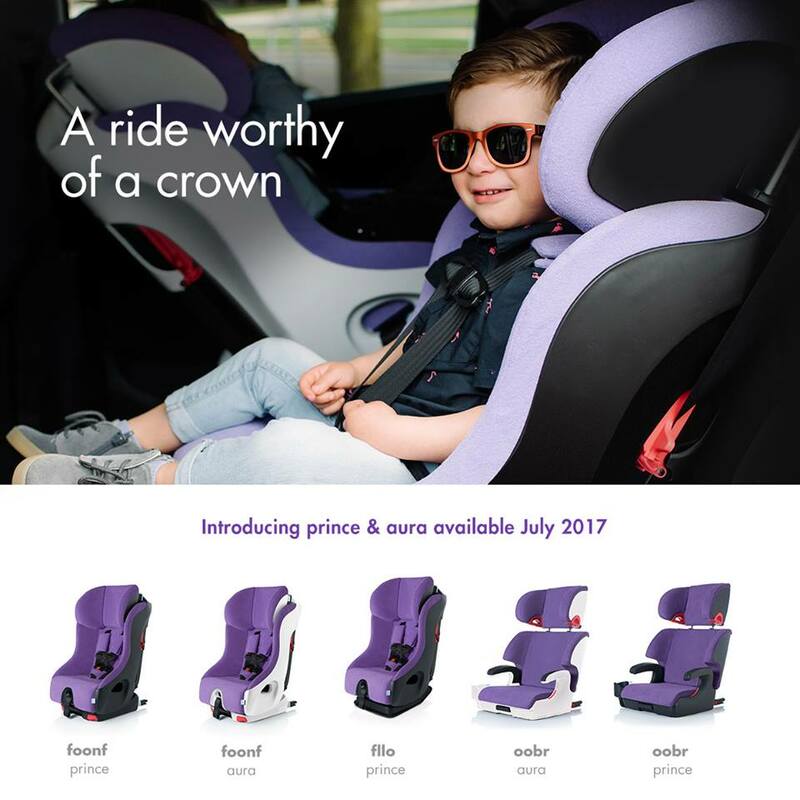 The Kioma Car Seat features a new, proprietary foam formulation that is not only comfortable, but has rebound (meaning will 're-inflate' itself and be ready to absorb more energy almost instantaneously). Function - Made from aerospace grade materials such as carbon fiber and aluminum, it's not only a great to carry but being so light helps in an accident as there is less inertia to change in the event of a sudden deceleration. This means more of the crash structure can be dedicated to slowly decelerating the child, instead of slowly decelerating the rest of the seat. The seat's lower weight also means less rotation in the event of a collision. Handle - Kioma designed the position, and most importantly, the angle, of the handle and grips so that the weight of the car seat Kioma car seat transfers straight down through your arm. This, in conjunction with the seat's narrow width, means that you don't have to bend your torso or flex your arm while carrying the seat. Just let your arm dangle straight down, and the center of gravity of the seat will do the rest. Other cool stuff - The bottom is made to rock a baby to sleep. It has removable, water-resistant upholstery. It holds a child up to 18 months old. Shoe company, Freshly Picked, is usually known for their moccasins. 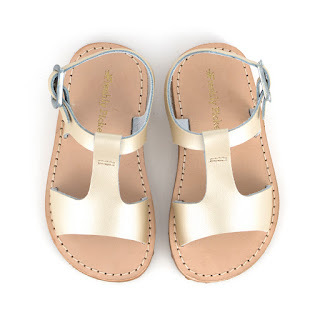 But now they are introducing sandals. The perfect summer fashion accessory for both boys and girls, The Sandal by Freshly Picked features a custom Italian prong-less buckle that makes putting the shoes on and taking off easy, and makes the sandals fit snuggly between sizes. Water resistant, they also feature genuine soft leather uppers, genuine leather insoles, and custom cushioned outsole for added comfort. Available now in four colors. A new accessory from Austlen - beach wheels! 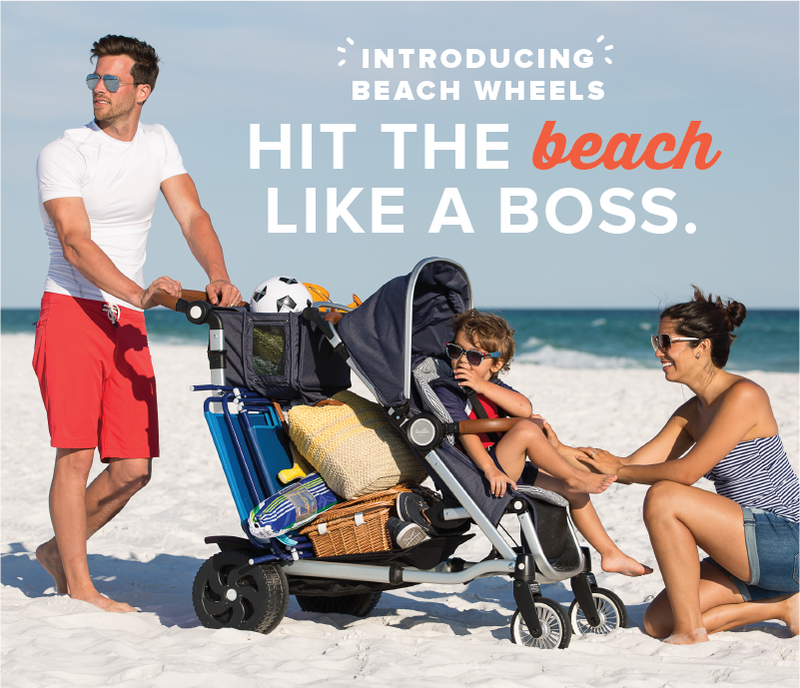 These dual-surface beach wheels roll smoothly from the beach to the boardwalk, so they have outstanding performance no matter the terrain. They also snap on and off real easy and shake clean. The wheels can be pre-ordered now and will ship next month. New products from Beaba. 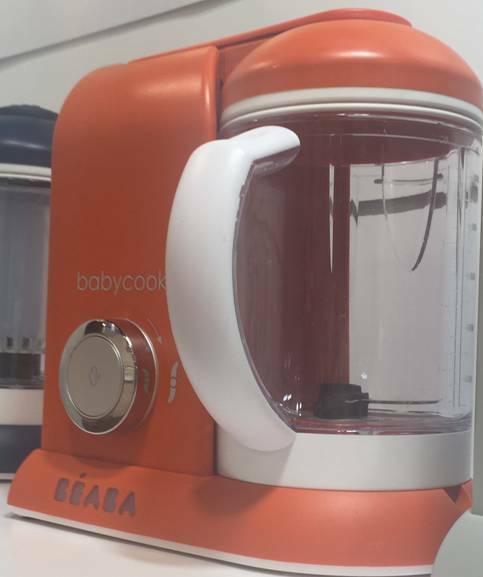 They will introduce a new color for the Babycook called Paprika (dark orange) very soon. A brand new item is the Ultra Fast Bottle Warmer, which heats bottles in under two minutes. It has a compact design and a tight lid that keeps bottles warmer for longer periods of time. The new MiniCall Audio Baby Monitor has a 1000 ft range. They are extremely durable: shock resistant and water resistant. 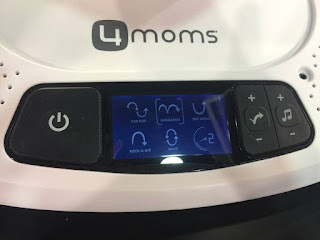 They even have a silent mode (LED lights = crying) and can be charged with a USB charger. 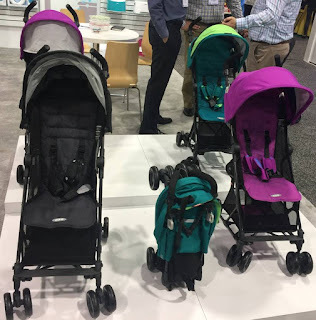 Two new strollers coming from GB. The Pockit+ (left) is an upgrade from the current Pockit. It offers a slight recline and also can be made into a travel system with either GB or Cybex car seats. Adapters are sold separately. The Caddy (right) is a car seat caddy only stroller (like a Snap N Go) and it will accommodate a GB, Cybex, Maxi Cosi or Nuna car seat. Both will be out at the end of the year. Some images from Tiny Love's upcoming Meadow Days collection, coming in June. The collection features woodland creatures on the company's popular products like the Soothe 'n Groove Mobile, Sunny Stroll stroller toy, Super Mat, Take Along Mobile and many individual toys. Also they are introducing a new gym, the Dynamic Gymini. 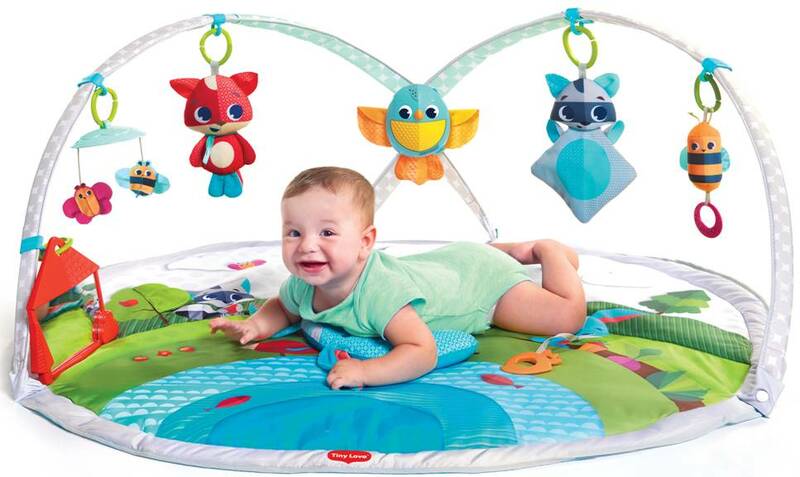 This will features moving arches with three positions for laying, tummy time and sitting. 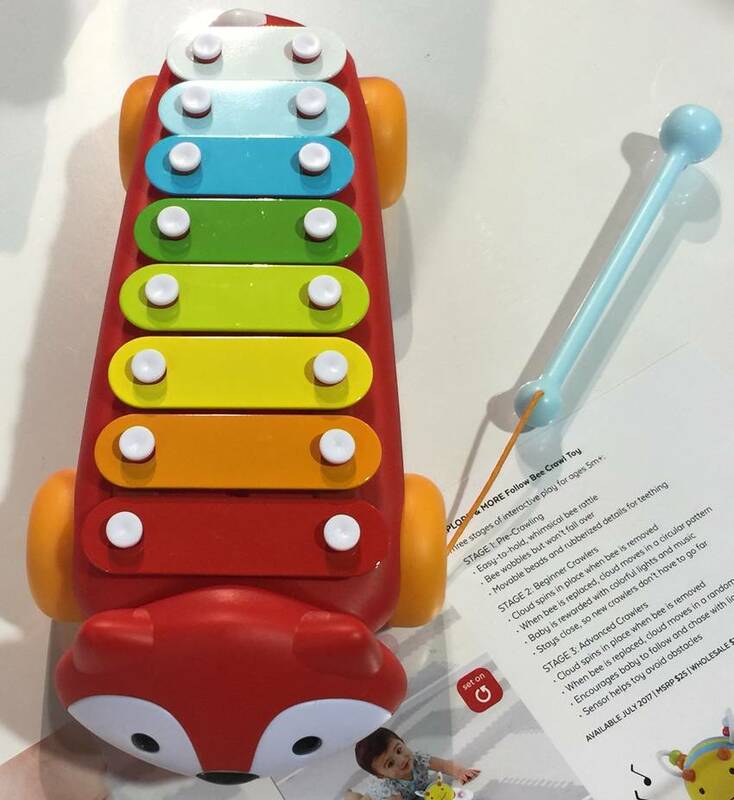 Also includes recording toys that offer music and lights feedback. Cybex's new American version of their popular Sirona M will hit the States by the end of the year. Lots of great features on this seat, one of which is very unique. The strap buckles work like magnet on the seat when you open them. You can see this above. This makes it easier to get the child in and out of the seat, with the straps totally out of the way. Changes have been made to the American version, including the raised headrest and a different base. 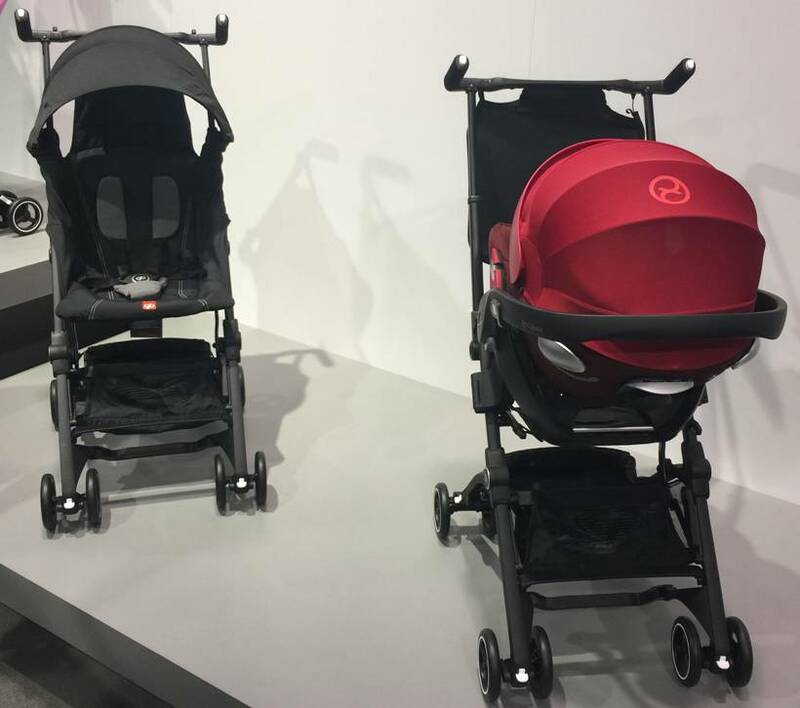 OXO's newest stroller, the Air, has a small compact fold and weighs in at only 11lbs. It opens and folds in one easy motion and also comes with an extendable UPF 50 canopy. It will be available in October. OXO will launch a potty line this summer that includes an easy to clean potty chair, a 7 inch step stool and an on-the-go potty for travel. 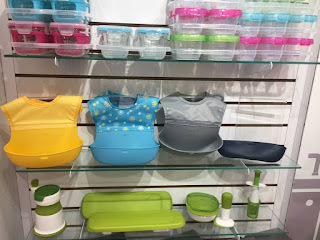 Other new products include new freezer storage containers, glass containers, roll up bibs and various product gift sets. Some of this is available now and other stuff will come out this June and July. New products shown by Skip Hop at JPMA. First is the Explore and More Activity Jumper, which has all kinds of cool features like removable toys and a counter on the side which counts and records baby's jumps. 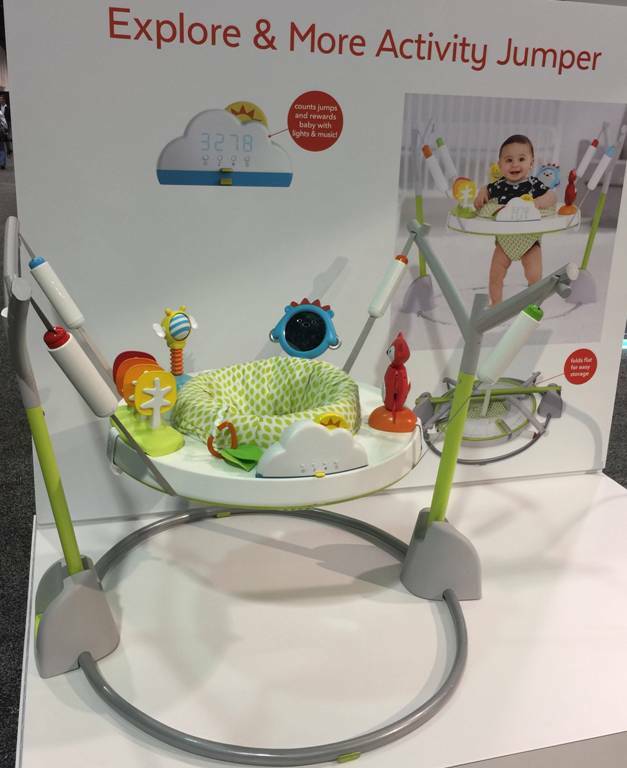 Baby is rewarded with lights and music when they hit a milestone. It will be out in September. 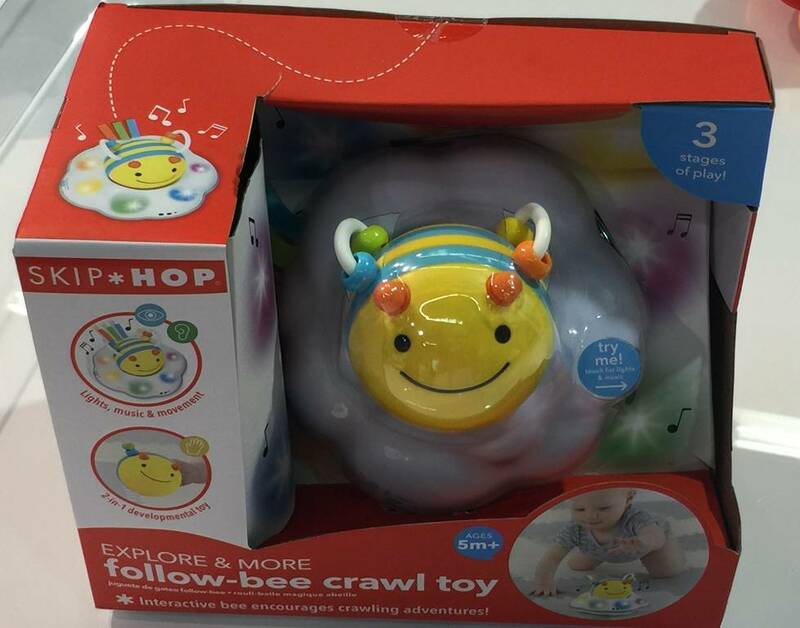 Next is the Follow-Bee, a motorized crawl toy that features lights and sounds. Next is the Fox Xylophone, which features eight keys and sounds. Also doubles as a pull toy. They come out in June. 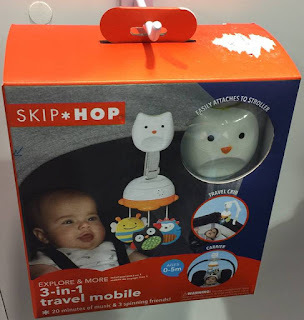 The 3-in-1 Travel Mobile attaches to car seats, strollers and even playards as it also comes with an extendable arm. 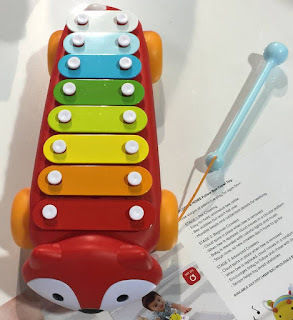 It has movement and plays 4 melodies. 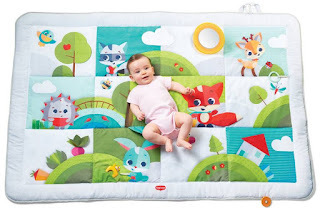 New nursery items include the Wipe-Clean Changing Pad, which is made of foam and lets you skip the sheet changes. 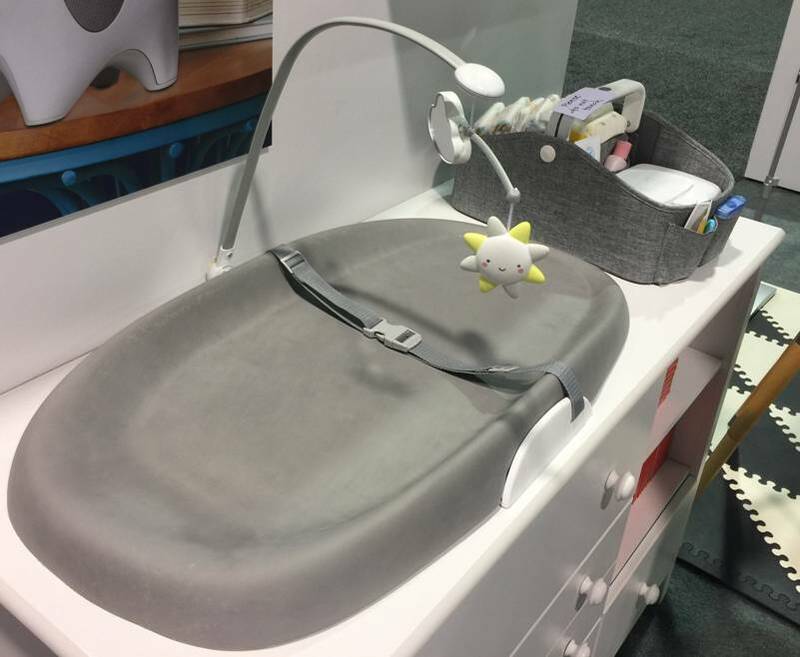 Also the Light-Up Diaper Caddy, which has a light on the hand bar. It comes on with a simple touch and has a 15 minute shut-off. These will be out in September. New items from Ergobaby introduced at JPMA. First is the collection with designer Keith Haring, which will be available this summer. 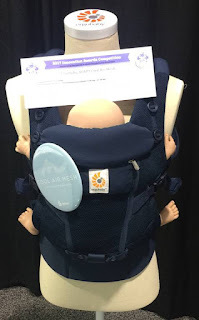 The two patterns will be for both the 360 All Carry Positions Baby Carrier and the Adapt Multi Carry Positions Baby Carrier styles, as well as the doll carriers. Second is the Adapt Cool Air Mesh baby carrier, which features 3D Air Mesh fabric. 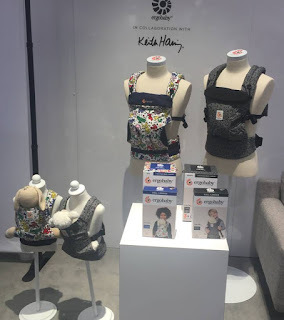 Ergobaby already had carriers available in 3D Mesh, and now it is available for the Adapt. 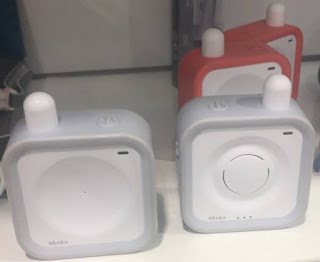 This product also won the JPMA Innovation award. The new updated version of the Mamaroo is coming soon! 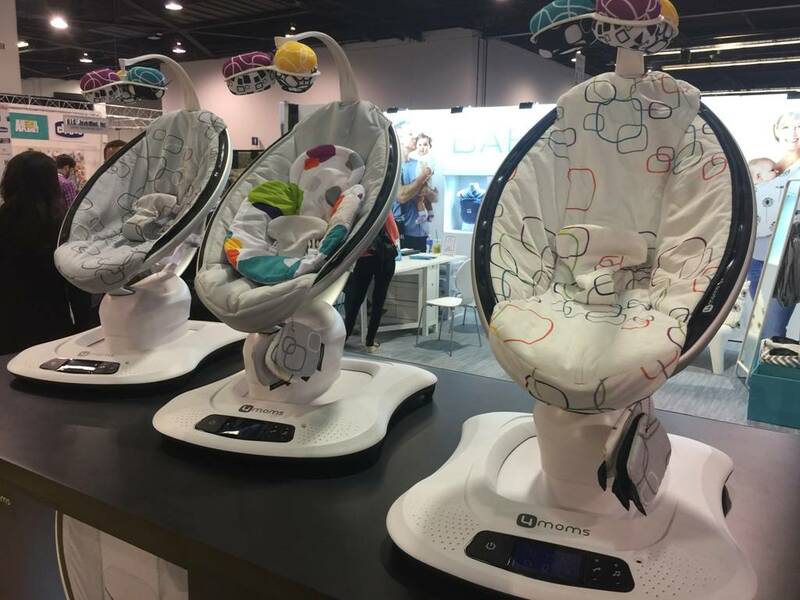 The Mamaroo4 was shown at JPMA last week. Besides the fashion and toy bar updates, the main difference is the new interface (shown above). It is much more user friendly and is now Bluetooth enabled, so you can control it from any smart phone. This is coming in July. Another new 4Moms product will be debuting soon too, but I don't have any pics or info. Just that is called the Breeze Go and is a smaller version of the current Breeze. It's expected out in June, so I will have more soon. Ergobaby debuted their new stroller, the 180, at JPMA last week. 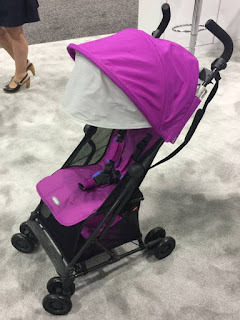 Some cool features are the ergobaby 180's reversible handlebar, a compact one hand fold, light weight (only 18lbs), extra large storage basket, extendable sun canopy and a really "cool" summer mode (Roll up the panels of the ergobaby 180 to reveal full mess sidewalls for cooler summer strolls). Another great feature is the the ergonomic comfort infant cushion, keeping in a comfortable and safe position. It is sold separately. Nanobebe is not like other bottles. Not at all. This bottle is designed to protect breast milk nutrients essential to your baby’s health. 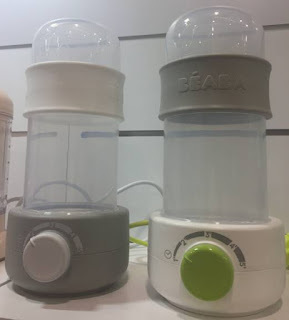 Thanks to its unique geometry and increased surface area, the bottle cools quickly, which reduces bacterial growth, and warms evenly, which prevents overheating. Its innovative shape allows babies to hold it on their own and self-feed at a much younger age. Using the breast pump adaptor included, you can pump directly into it and then store it in the freezer or fridge. And it warms up 2-3 times faster than standard bottles, so you can promptly feed your crying baby. 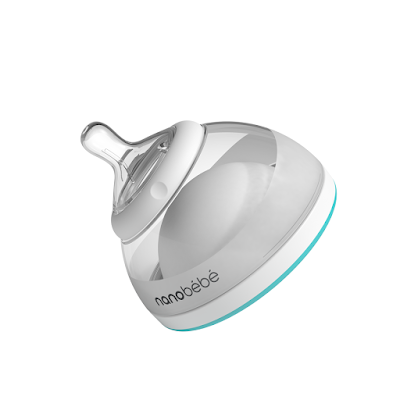 Nanobebe also makes its own warmer, drying rack, steam sterilizer, storage bags, bottle brush and pacifiers. All of this is available on their website. The LapBaby is one of those products I look and wonder why I didn't think of it first! The LapBaby is an innovative seating aid that keeps your hands free while supporting your baby on your lap. This product allows you to comfortably and securely support baby on your lap using a soft strap around the waist and back. The LapBaby fits most waist sizes, and is adjustable. It comes with a soft drop cloth for spills during mealtime, and a pacifier/toy tether, to keep their favorite item close at hand. It is available now on Primo's website. Baby Trend is getting into the mattress business and their first one is something special. The Respiro Mattress was created to address the areas where many conventional crib mattresses are fundamentally flawed: they lack air circulation, are not breathable, are infused with carcinogenic flame-retardants and are an ideal environment for dust mites and bed bugs. Engineered with high-tech mesh fabric stretched tightly on its frame, and featuring open-air sides, the Respiro Mattress is completely breathable and guarantees 100% ventilation. By not using foam and stuffing in the Respiro Mattress, the need for toxic and carcinogenic flame-retardants is also eliminated. It will be released in early 2018. 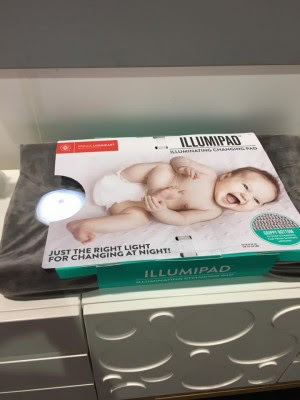 A new innovative changing pad from Prince Lionheart, the IllumiPAD. It includes a built-in LED light at the bottom of the pad so that you can do changes in the dark. A silicon cover protects the pad when things get messy. Not available yet, but you can preorder soon at PishPoshBaby. 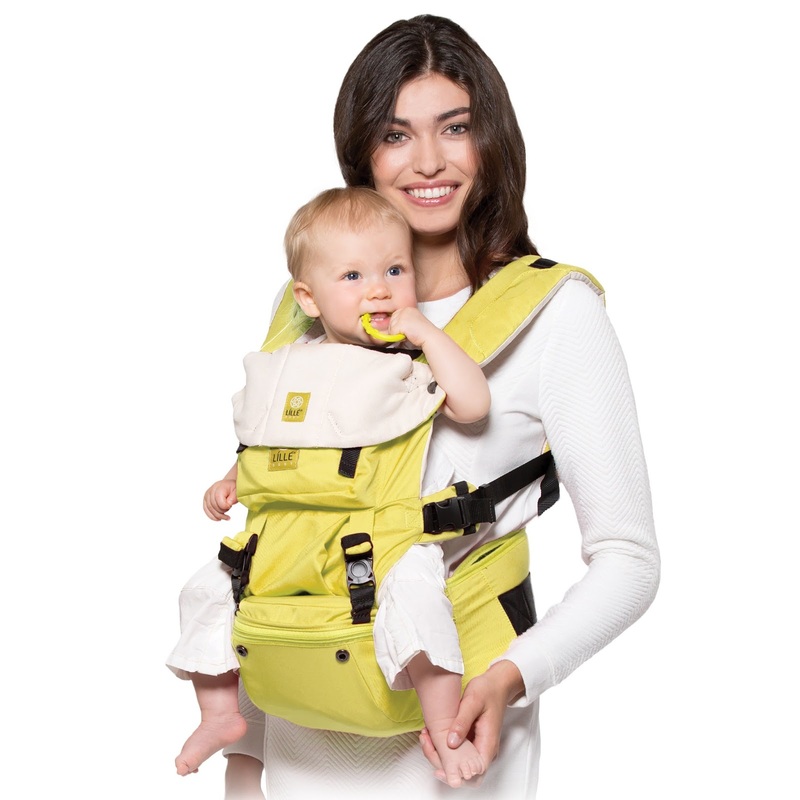 Lillebaby's newest carrier, the SeatMe, is now available. The SeatMe hip seat carrier is a multi-functional baby carrier with an integral firm and padded shelf seat for the child to sit on. The shelf-seat supports baby’s hips and makes it easy to position baby’s hips in a correctly supported position. The unique seat design allows adjustment to the depth of the seat to ensure babies of various sizes are positioned close to the parent for safety, comfort and reduced leveraged weight. Right now they are 20% off on Lillebaby.com. A new product that is currently up for the JPMA Innovation Award is the Rock On The Go. It the first compact, portable, and easy-to-use device that converts any standard four-legged chair into a rocking chair. Take it on vacations, use it around your house, take it to the sitter's, really it can be used any and everywhere. Rock On The Go fits in a standard diaper bag or large purse and can be installed in 90 seconds or less. Currently it is not available, but you can sign up for their wait list. This new add-on accessory is made for the Joovy's new Room² playard and can be used for twins or one baby. 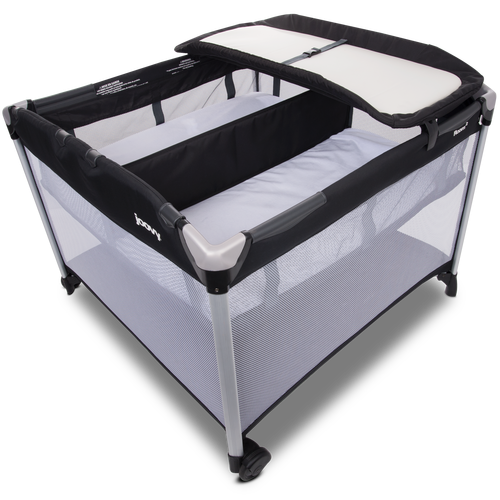 It features a large bassinet that is ready to hold twins or two babies up to 15 lbs each (30 lbs total). A removable center divider zips into place to give each baby a separate napping area. Also included is a a changing table that supports a baby up to 25 lbs and has a machine washable surface. Look for the Joovy Room² Twin Nursery Center next month. Three new colors for the Stokke Tripp Trapp, all inspired by nature. Moss Green, Heather Pink & Forest Green have all joined as official colors. You can purchase any of the three on Stokke.com right now. 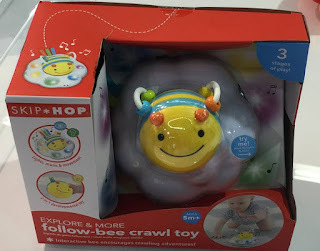 Tiny Love's newest bouncer, Nature's Way Bounce & Sway, is hitting stores next month. 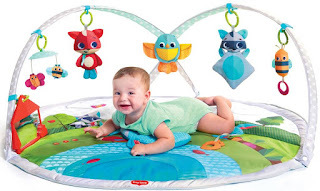 It is the first bouncer that oers the combination of 2 unique motions, soothing sways and perfect bounces, making it a swing and bouncer combo product. It only takes a gentle touch to create the natural swaying motions, and as baby moves and plays she generates perfect soft bounces. 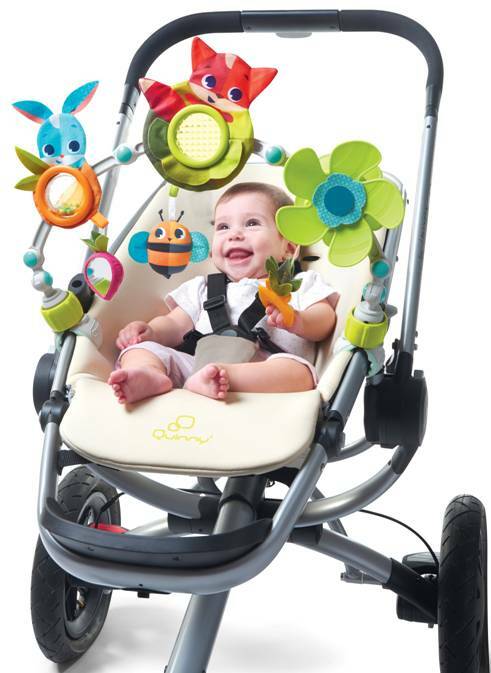 The frame of the bouncer is made from springy steel which enables the sway movement that lasts more than 30 seconds. 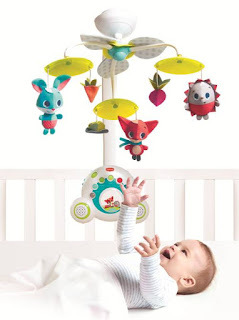 The springy seat frame of the bouncer is connected to the base from the upper part to create the ultimate bouncing movement. The all new Special Edition pushchair range from Silver Cross Pram is out. . 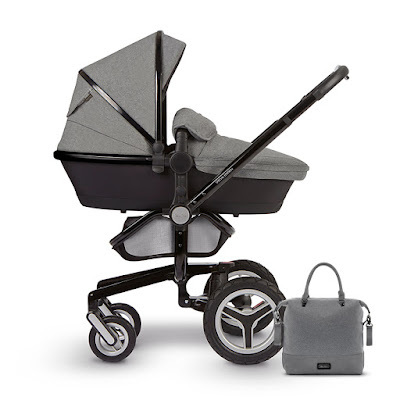 Using only the highest quality materials, Silver Cross has reimagined three of their best selling prams; Surf, Pioneer and Wayfarer, to offer you the ultimate 3 in 1 travel system with a touch of luxury and quintessential British charm. There are three fabric hoice: Expedition (light brown weave fabric on a gloss bronze chassis) , Henley (navy fabric on gloss graphite chassis) and Eton Grey (grey fabric on a gloss black chassis). Each pram comes with a footmuff, raincover, car seat adapters and luxury tote bag. This was introduced by Clek today at the ABC Spring conference and their on their social media. Two new colors Aura (purple on white) and Prince (purple on black) will be available in July on all of their current seats. 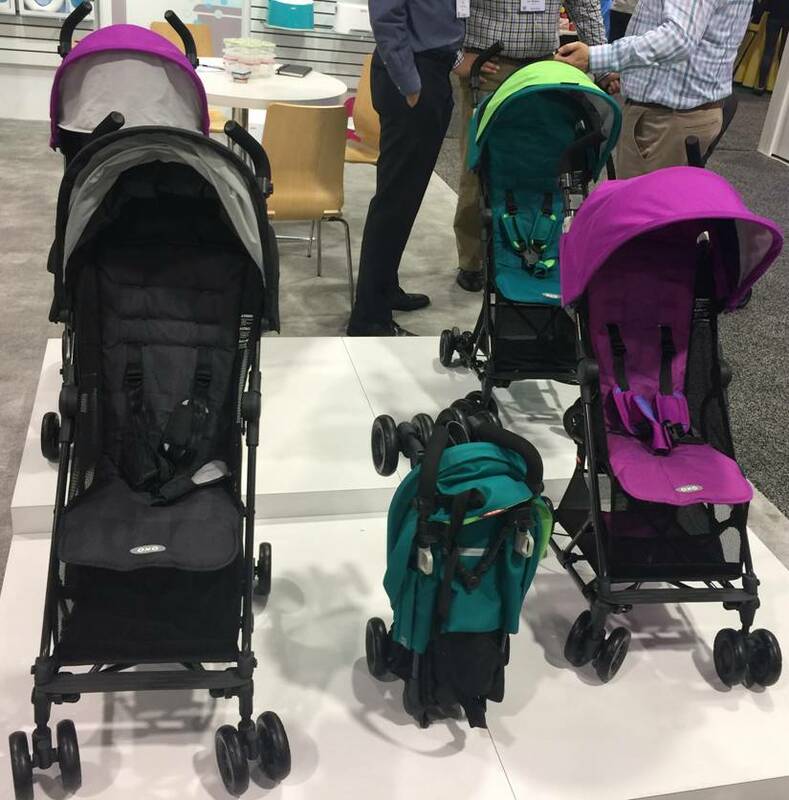 The new 2017 Uppababy Vista is now available in Sabrina (pink) exclusively at BuyBuyBaby. 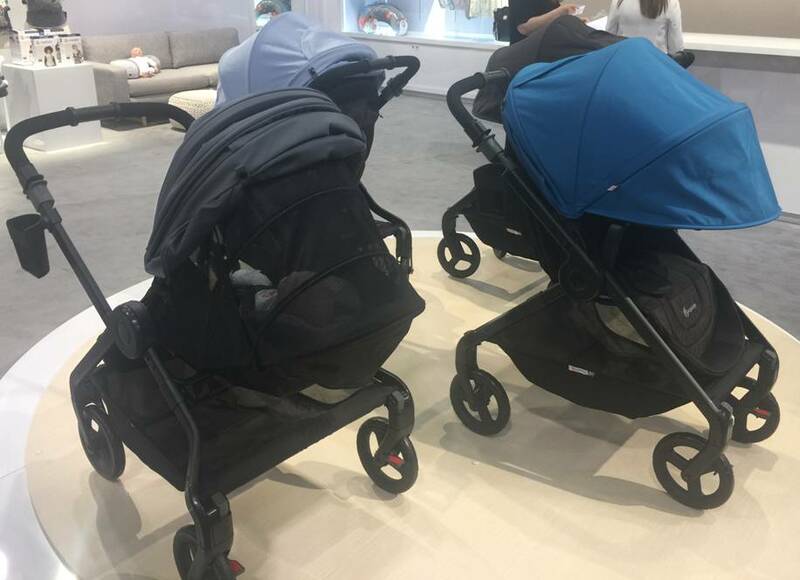 The stroller was updated for 2017 with new fabrics and leather handles. You can also buy the matching reversible Rumble Seat for a double version.